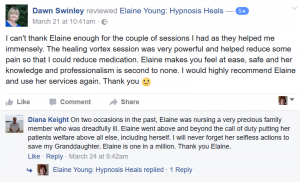 “I’m so grateful for the sessions that I had with you Elaine. 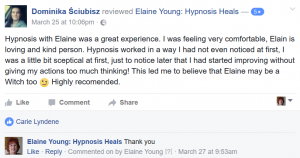 Not only is my endocrine system in balance and working as it should after our healing vortex session, additionally I have such a sense of peace in my soul. To know that my body can heal effortlessly is such a blessing. Thank you so much for helping me to fully connect with my history, my origins and to own my place in the world. My sense of self is now complete. And as such I have every confidence that I can now fully embody my true potential. Ain’t no stopping me now. I too, wish we lived closer to each other. I’m so much richer for my time with you and look forward to many more adventures together. Let’s make it happen.